The first time I heard of Fractal Design I was still heavily invovled in the Windows Home Server community. The Fractal Design Array Mini-ITX NAS case was shaping up to be the ultimate choice for the DIYer looking to build a compact appliance-style WHS box. The original Array was popular, but not without its flaws, and so Fractal Design released the Array R2. For the Array R2, Fractal Design tweaked the design to improve airflow and cooling without giving up the phenomenal storage capacity that one would want in a case targeting the home server and NAS market. We took a look at the Fractal Design Array R2 just about a year ago, and liked what we saw. Our friends at Techgage recently took the Array R2 for a spin and it sounds like they came to similar conclusions. It’s hard not to like a Mini-ITX case that can hold up to 6 3.5″ hard drives without losing its cool. 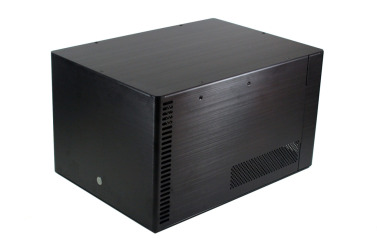 Designed and marketed as a home NAS or server chassis, the Array R2 was built to house mini-ITX motherboards. Built entirely out of aluminum and rivaling Lian Li for quality and style, the Array R2 can house an astounding 7 hard drives (6x 3.5″ drives and 1x 2.5″ HDD or SSD) and ships with a Fractal Design-branded 300W SFX power supply.